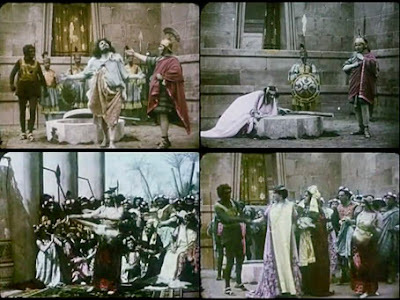 Just like Herod, you will fall under the spell of the Dance of the Seven Veils of Salome, which I think may be the best I have seen on film, since most other depictions tend to emphasize the sleaziness over the artistry and sexiness of the dance. John's religious zeal, the dynamics between John and Salome and Herod and Salome, the day-to-day horrors that take place in Herod's court (i.e. the killing of an innocent slave girl), and even the unabashed lechery of Herodias, who flirts brazenly with the Roman Proconsul, are all depicted in this short film. And though the film is short, you get a very powerful sense of who Salome is as a person.